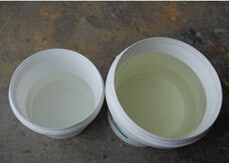 Resin Crack Pouring Adhesive - MUHU (China) Co., Ltd.
2. Grouting repairing for cracks in the concrete surface, floor and basement. 3. Compact grouting and repairing for veneerings of the granite, marble and tile as well as hollow joints. 1.Good permeability. It fills in tiny cracks like water does. 1.It’s mainly used for repairing concrete cracks in bridges, beams, road pavement and other building projects. 2.It’s specially used when working area is dry, low adhesiveness and high strength. Cracks and surrounding sundries and floating dust shall be cleaned up with steel brush. One base shall be buried every 150mm – 300mm, with additional one at crack crosses. The base shall be pressed for another 3- 5 seconds after the gel is out of the next base,followed by the next step. The application time is 50 -60min. The injector shall be cleaned with the thinner immediately after use of each batch.